Walter Clemens, Berenice Bennington, and Mrs. Freeman are elderly patients who've died--a little unexpectedly--at New Haven's Chelsea Memorial Hospital. Millie Clemens, widow of the first victim, is screaming foul play to anyone who'll listen, and Bennington's niece Janet claims to have seen nurse Jillian Hash kill her aunt. R.N. 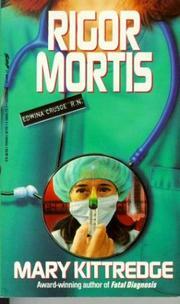 Edwina Crusoe (Fatal Diagnosis), now a sleuth in medically oriented cases, is hired by the dead Jillian's crassly autocratic father to find the truth. This she does, in an investigation loaded with technical medical lore on the living and the dead. Edwina's own life, at risk in a confrontation with the killer, is saved by police detective boyfriend Martin McIntyre, finally on a first-name basis with Edwina's millionairess, best-selling novelist mother. A numbingly labyrinthine plot in a story helped by Edwina's straight-arrow charm, some charismatic minor characters, and the author's easy style. Add a plus for hospital-background fans.